How about adding some colour to your lab days? UCS is running a FREE lab coat tie-dye session THIS Thursday 2-5pm in B470/472! All you need to bring is yourself and your lab coat. Come drop in anytime between 2-5 and we’ll provide all other supplies! The Undergraduate Chemistry Society is honoured to receive this year’s Science Student Impact Award and to have one of our team members being an AMS Just Desserts Award recipient. Thank you to everyone who has supported us throughout the year! Photos are courtesy of the UBC Science Undergraduate Society. Bored of drinking out of regular mugs? Enter our monthly beaker mug giveaways for a chance to win an awesome beaker mug! The beaker mug will be stuffed with lots of candy and chemistry-themed goodies! Learn more by visiting ucs.chem.ubc.ca/about/beakermugs/ for more information. 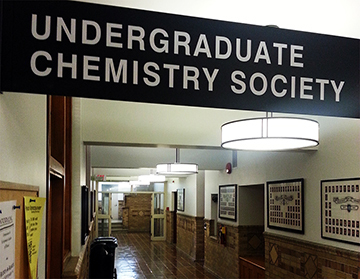 The UCS Lounge is at Chem D132. Visit us!